Farrar and Rinehart, 1941. Hardcover. Very Good/No Jacket. 8vo 7.75 - 9.75'' tall. "Nice Firm Clean copy ! Light general wear. 364 pages. . ISBN: B002IXXWKC. Catalogs: Schools/Groups:. New York: Farrar & Rinehart, 1941. In a Mylar dj cover. A clean, bright, tight copy.. First Edition. Cloth. Near Fine/Very Good(minor Rear stain). Illus. by John O'Hara Cosgrave II Dj Art. Octavo. New York: Farrar & Rinehart, c1935. 1st edition . Hardcover. Very good condition. top of spine worn in chipped d.j. J. O'H. Cosgrove II. 364p. illus. Farrar & Rinehart, New York, 1941. Hardcover First Edition. 8vo., 364 pages. Black lettering on red boards. Very good covers, corners and edges. Very little if any wear. Text and interior are very good throughout. Dustjacket is showing some wear and a small tear, but bright and colorful. Jovial autobiography that starts and ends with Harvard. Illustrated with woodcut-type b&w illustrations. New York: Farrar & Rinehart, 1941. Hardcover. Good. First edition. Good Hardcover. Book has minor wear of all cover edges, small indent bottom front cover edge, browning cover edges, minor soiling foredges. Text is clean. Please Note: This book has been transferred to Between the Covers from another database and might not be described to our usual standards. Please inquire for more detailed condition information. Farrar & Rinehart. Very Good with no dustjacket. 1941. First Edition. Hardcover. Bookplate on front free endpaper. ; 8vo; 364 pages . Farrar & Rinehart. 1941. First Edition. Hardcover. Very good+ in a very good- dustjacket . Crown, 1992. First edition. Near Fine book in a Near Fine dust jacket. Farrar & Rinehart, New York, 1941. First Edition. A near fine copy in the publisher's original title-blocked cloth. Slightest suggestion only of dust-dulling to spine bands and panel edges. Remains well-preserved overall; tight, bright, clean and strong. ; 364 pages; Illustrated by J. O'H. Cosgrave II..
NY: Farrar & Rinehart, 1941. Very good; dust jacket in two pieces, sunned, poor. 8 vo. 364 pp. B/w chapter heads & illustrated end papers of Harvard by J. O. H. Cosgrave II, red cloth. Serving the antiquarian and used book world since 1980. Hard Cover. New York: Farrar & Rinehart, 1941. First Edition. Farrar & Rinehart colophon. Very Good in red hardcover in a Very Good unchipped dust jacket, modest edgewear. 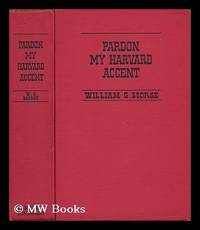 Morse's memoirs of early tun of the century New York,, his graduation from Harvard and later his career there a purchasing agent, the many stage and literary lights he has met. etc. 364p. 1st Edition. Hardcover. Very Good/Very Good. Illus. by J.O'H. Cosgrave II.